With the storm season recently upon us, it’s not uncommon to switch car headlights on during the daytime. Unfortunately, it’s easy to forget to turn them off again when parking, with the result being a flat battery. This circuit will sound an alarm if the ignition switch is moved to the "off" position while the car lights are on, reminding you to turn the lights off before leaving the vehicle. The circuit is simple but effective. 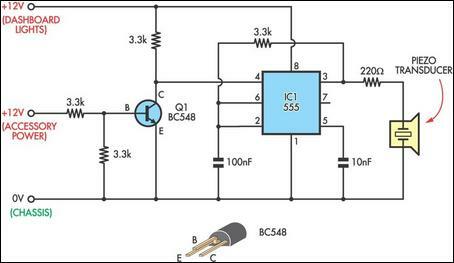 A 555 timer (IC1) is configured as a free-running oscillator to drive a small piezo transducer. The pitch of the transducer is set by the resistor and capacitor connected to pins 2 & 6. Power for the 555 is derived from the dashboard lighting circuit. However, the piezo does not sound during normal operation, because the 555’s reset input (pin 4) is held low by transistor Q1. This transistor is switched on whenever accessory power is present, pulling its collector towards ground (0V). If the ignition is switched off but the lighting circuit remains powered, the loss of accessory power results in Q1 switching off and releasing the reset signal to IC1, sounding the alarm. A 220Ω resistor in series with the piezo protects the 555’s output (pin 3). Although most piezo elements have relatively high impedance, this drops as the frequency increases due to their capacitive nature. The square-wave output on pin 3 includes many harmonics, some extending well into the ultrasonic range. The unit fits easily into a small plastic box. I spliced mine into the wiring running to the cigarette lighter, which includes both accessories and panel lamp circuits as well as a chassis ground wire. The result fits neatly behind the ashtray, with no chassis bashing required!